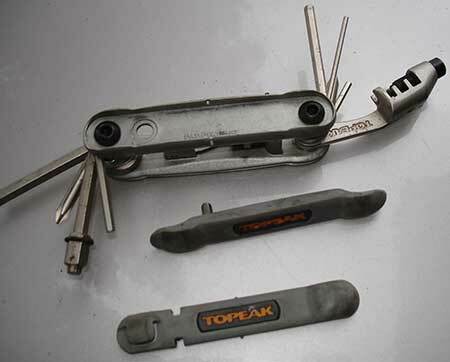 I own two Topeak mini tools… not entirely sure why I have two, but suspect one was a present at some point… anyway they make a nice comparison. The smaller, or rather more compact, of the two is a Topeak AlienXS. It’s a neat package in a black velcro bag, with a number of tools spread across two ‘halves’ that can be separated to make them easier to use. My AlienXS didn’t come with the chain tool offered with the latest version and out on the road, I’ve only really ever used the 2, 5 and 6mm allen keys, and maybe the phillips head screwdriver. So I’ve always felt that I was carrying too much ‘tool’, and thought that a couple of simple allen keys would normally suffice, as a result the AlienXs is still pretty clean. By comparison, my older Topeak Hexus-type tool is a grimy piece of kit that comes out on pretty much every ride, regardless of whether it’s on the road, off-road or just a Saturday spin out with the kids to the pub in the next village. The thing about the Hexus is that it has all of the tools you need in a usable package. 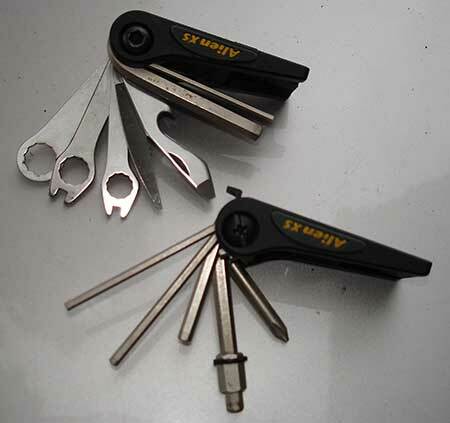 The Hexus does away with the ring spanners and knives, that the AlienXS has, and just offers allen keys, a screwdriver, a chain tool and some tyre levers. It’s only a matter of time before I eventually lose one of those tyre levers, as they fall of the tool quite easily now, and the bolt that holds the tool together does have a tendency to come loose, but overall the Hexus works well for me. It it a fairly chunky tool, but when you’re trying to fix a bike a long way from home in the pouring rain, you want a tool that actually works – in fact the Hexus is so good that it regularly gets used in the workshop, which is something I wouldn’t do with most mini tools, just in case I rounded an allen key trying to loosen a bolt. Finally, I know that the purists would argue that you’ll never need a chain tool on a ride if you bike is well maintained, but chain problems do occur and it’s good to be able to fix them – earlier this year the chain snapped on my road bike*, and last year the chain on one of the boy’s bikes slipped down between the frame and the chain set, these things happen and a chain tool keeps the ride going. So the favourite is the Hexus… it’s a solid piece of kit that has the right tools for most roadside repairs. *To be fair, when the chain broke on my way into Bath, the result was a wrecked front mech and my family were en route to meet me further along, so I requested a rescue rather than repairing the chain in single-speed mode… but the Hexus would have worked. Note that there are slight changes to these Topeak versions since I acquired mine.